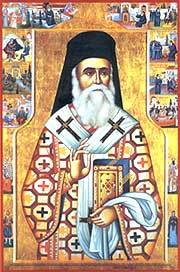 St. Nektarios: Christians, have we understood the great responsibility that we have taken . . . This entry was posted in Sayings from Saints, Elders, and Fathers, St. Nektarios of Aegina and tagged Baptism, God's Will, Kingdom of Heaven, Love, Love of God, Loving Neighbor, Neighbor, Responsibilities, Sin, Spiritual Warfare, Suffering, Transforming into a Saint, Virtue on September 15, 2014 by .